To customize this template after signing up, choose ‘Risk Assessment’ as example when creating a new survey. Why use a risk assessment? Risk Assessments are an essential part of any business, not only because of their practical use, but they are required by law (in most countries). In the United States, you are required to document anything if your business has more than 5 employees. Risk assessments must be conducted before employees go to work on current or new work processes to ensure they recognize problems before they have a chance to surface and prevent people from harming themselves, others or the business. You will already have some measures in place to protect you and your employees. But a risk assessment must be made to ensure those measures are both known and up-to-date. What is it about the activities, processes or substances used that could injure your employees or harm their health? Step 2: Who may be harmed and how? This means employers must consider how likely it is that each hazard could cause harm. This will determine whether or not your employer should reduce the level of risk. Have your workers spotted a problem? Why use Survey Anyplace as Risk Assessment Tool? Turn completed assessments into personalized reports to share with the management via our automatic PDF generator. We at Survey Anyplace realized that paper assessments and forms are slow, messy and a thing of past and made all our software mobile optimized to ensure you can perform at your absolute best. Build, sculpt and craft your assessment to take on every kind of situation. Awesome features like Offline Mode and Multiple Languages will make your risk assessment work like a charm in any environment. 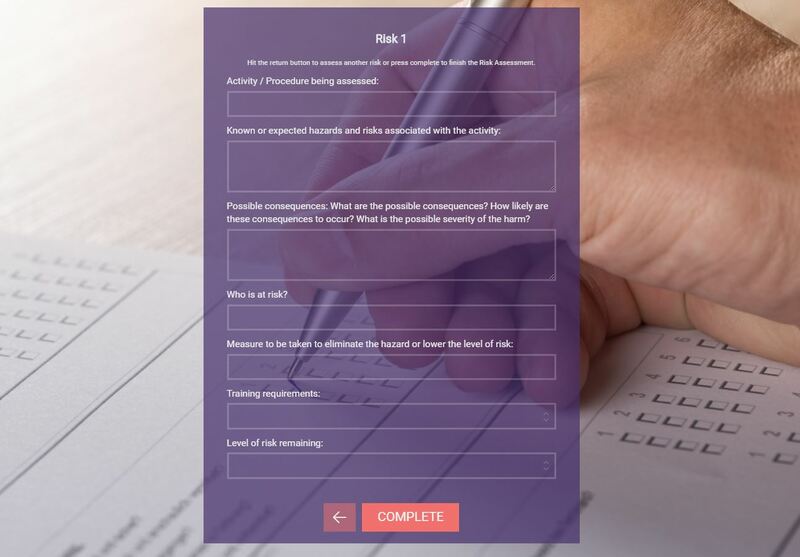 To use this sample risk assessment, sign up for Survey Anyplace , and choose ‘risk assessment’ as template when creating a new survey. What is the risk or potential hazard in question? What measures have we taken to control those risks? What rating do we assign to this risk? How big of a threat does it pose? What measures do we have in place to prevent these risks from occurring? Whose responsibility is it to control this risk? It is important that the assessment details can be collected efficiently and that they are automatically transferred to a central storage system where the data can be analyzed. Devices such as a tablet or smartphone are ideally suited for this task. Risk assessing through paper forms, pdf or word documents is also possible but has the disadvantage that the data still needs to be transferred to a central system as a separate action, which is error-prone and time-consuming. Make your company a safer place to work with our risk assessment tool.